Thomas Moore in full flow...Inzi backing up. June 24th, 2011. Lashings World XI 229-5 (35 overs). 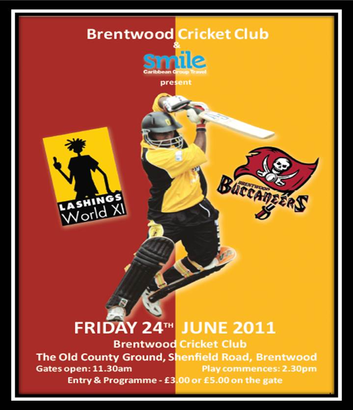 Brentwood Buccaneers 144-2 (26 overs). Match Abandoned. Brentwood Cricket Club’s match against a World-Class Lashings side was cruelly denied a finish as rain ended a match that was so close a Duckworth-Lewis calculation had only one run between the two sides. Whilst the cricket was the centre point of the occasion, it is fair to say that there was sufficient entertainment throughout the day to keep the packed ground enthralled; in fact it is a safe bet that at no stage in the illustrious history of the Old County Ground have players hung out of the changing room windows whilst a note-perfect ‘Nessun Dorma’, sung by Henry Olonga, rang around the perfectly manicured ground. On top of that, the man who is probably described as inimitable more than any other, Henry Blofeld, not only provided commentary to the crowd, but gave some insight into the now infamous “TMS Bat-Rubber Gate” to those enjoying lunch in the marquee. Once the game got underway, things could not have started worse for Lashings as Rashid Latif was out first ball to Max Osborne. However, this just meant the 7th highest International run scorer of all time, Inzamam-ul-Haq, strode to the crease. The man once described by Imran Khan as “the best batsman in the world against pace” looked immediately at ease against Brentwood’s seam attack, only once flirting with danger as a top edged pull was carried over the boundary line off the bowling of Osborne. Inzamam cantered to a 50, playing only a few shots in anger, but with barely a dot ball in sight. However, when he did go large, they were mighty effective, once clearing the full marquee as he eased the ball over square leg. Almost as soon as he had hit the milestone, out of nowhere, Joe Buttleman struck, trapping the great man leg before. Wasim Jaffer, the scorer of two Test double hundreds and still playing first class cricket in India had so far played second fiddle to Inzamam, but he did not last much longer either as his forward defence was penetrated by Ian Belchamber, whose delivery just clipped the top of off stump. The Kiwi pair of Ian Butler and James Marshall then took the attack to Brentwood. Butler in particular, a member of the 2010 T20 World Cup squad, struck some mighty blows, including one that cleared the biggest tree on the OCG. Once the New Zealand pair had been dismissed, Butler to a fine diving catch in the deep by Brentwood’s own Kiwi, Mike Pollard, and following a brief Phil Defreitas cameo, it was left to two legends in Saqlain Mushtaq and Gordon Greenidge to see Lashings to what was probably around a par total. Greenidge in particular defied his 60 years of age, with shots of the highest quality – one a whip through backward square leg for six and a loft over midwicket that simply oozed class. Brentwood, though, would have been delighted with their fielding efforts and whilst all the bowlers played their parts, Sam Pountney ended up the pick with two wickets, including bowling the death overs extremely well. The Lashings opening attack of Devon Malcolm and Mohammed Akram could clearly still put the ball through without too many issues. However captain Jon Walford played some exquisite shots, most notably some shots through mid-wicket off his hip off Akram. Once both openers were dismissed, James Redwood and Pollard set about the International attack. Redwood moved past his 50 with some dashing strokes, putting the inventor of the doosra, Saqlain, through the covers on more than one occasion. Just as he and Pollard were really starting to motor towards the Lashings total, the rain started to fall. Although starting light, it was persistent and meant that play had to be abandoned with 9 overs remaining. Redwood was deservedly given the Man of the Match award for his batting and keeping performance. And the winner - were the game to have been decided by Duckworth-Lewis? Brentwood. 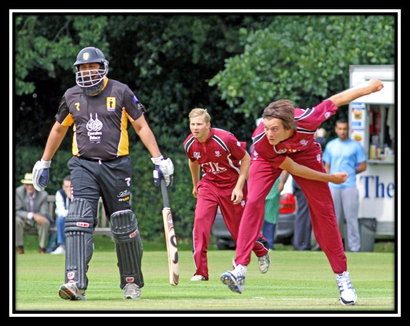 Photo gallery to other images from the 2011 Lashings World XI match.